Approximately 7,000 men and women worked for CSR blue asbestos mining and milling operations at Wittenoom. Approximately 13,000 non-workers resided in the Wittenoom township i.e. women and children (7000 were children either born in Wittenoom or they arrived with their parents). To date more than 2000 of the workers and residents of Wittenoom have died from Asbestos Diseases. Existence of Crocidolite in Hamersley Ranges has been known since 1915. In 1923 a Ton of Blue Asbestos could fetch 80 Pounds Stirling in England. About 1925 Asbestos rush occurred in the Pilbara, however tyranny of distance and the terrain difficulties forced the prospectors to sell their claims to speculators. In 1939 the Late Mr Hancock and his associates constructed primitive Asbestos Crushing Plant on the site which became known as the Wittenoom Mill. In 1943 CSR purchased the Leases and primitive Mill structure from Hancock Syndicate (Messers Lang Hancock, Wright & Warren). Mr Lang Hancock became Superintendent of the Blue Asbestos Mining and Milling operations. The company was incorporated on the 17th April 1943 and continued its operations of Asbestos Mining and Milling at Wittenoom and Colonial Gorges until 30th December 1966. 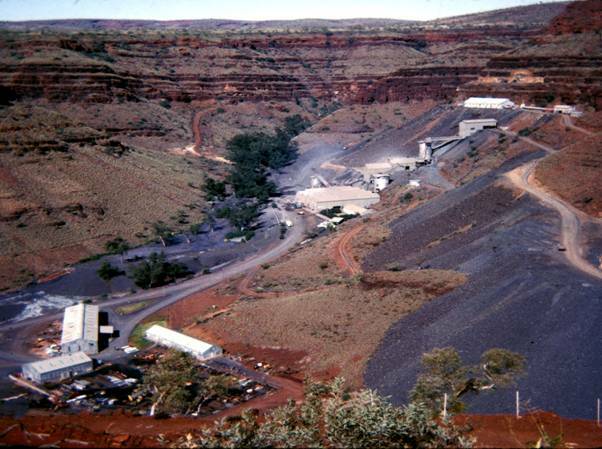 CSR and its subsidiary ABA operated 2 mines and Infrastructure at Wittenoom from 1943 to 1966. The processed Blue Asbestos fibre was transported to Point Samson on open trucks. The Blue Asbestos fibres were stored in sheds at Point Samson and loaded onto Ships. About half of the Blue Asbestos fibre production at Wittenoom was sold to overseas interest and the rest was used in Australia. To accommodate the Mine and Mill workers, tents were erected approximately a kilometre from the Mill. Staff and other more important employees were accommodated in a small estate of 13 houses about 600 metres from the single men’s tents. Offices and the company store were located between the single men’s tents and the housing estate. Up to 1947 there were up to 200 Miners and Mill workers employed to carry out the Milling and Mining Operations. 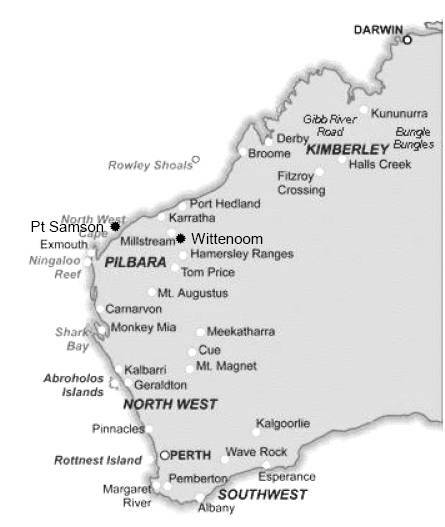 To increase the production of asbestos fibre CSR approached the WA Government for assistance to establish a town 7 miles from the Mining and Milling Operations to accommodate additional workforce. The WA Government agreed to supply all housing requirements, a school, post office, hospital, police station, water supply and to bitumise the seven mile road connecting the town with the mine. CSR agreed to provide hotel, general store, butcher, bakery, cafeteria, library, café and employees amenities building and accommodation for 100 single men. The building commenced in 1947. There is absolutely no question that CSR knew that asbestosis and cancer were extremely likely results of working in conditions such as those they permitted in Wittenoom. (CSR’s knowledge was established in the Victorian and Western Australian courts through the judgements of asbestos-caused injury litigation). During the mining operations, more than 20,000 men, women and children lived at Wittenoom. Some of the workers sent there were part of the Commonwealth Government policy to place new migrants for a period of two years in any work situation. Dr Jim McNulty AO visited Wittenoom milling and mining operations between 1957 and 1962 in his capacity as a chest physician, mines medical officer. In 1962 Dr McNulty diagnosed the first mesothelioma case in Australia in a worker employed at CSR’s blue asbestos mine at Wittenoom. Upon diagnosing this first Australian mesothelioma, Dr McNulty personally explained its significance to CSR’s subsidiary management (Australian Blue Asbestos Pty Ltd) stating “that the relatively short period of exposure to blue asbestos confirms the impression that these tumours may arise after transitory exposure to crocidolite." He also sent them a copy of his paper describing the case which was published in the Medical Journal of Australia. Dr McNulty is adamant that CSR was always aware that if it continued to run the mine without adequate dust suppression, they could be endangering the Wittenoom mine and mill workers to a very grave degree. One of the strongest warnings was given in writing to CSR’s consulting doctor, Maynard Rennie, by West Australian specialist Dr Bruce Hunt on September 25 1961. He wrote, “It would obviously be much more satisfactory if the company (CSR) itself took the necessary action – which I suggest should start with an inspection by yourself and by a well qualified ventilation engineer. After examining the evidence which has been produced for you I find it very difficult to believe that a reputable public company (CSR) could remain in its apparently self satisfied state and continue to allow the asbestos mining industry to go on killing men unfortunate enough to be employed in it. If however the present situation is to remain unaltered I feel it my bounden duty to bring the matter to the personal attention of the Premier." In 1962 the matters of poor hygiene and excessive dust at the CSR Wittenoom mine and mill were brought to the attention of Premier and Cabinet of the day. Sadly, no action was taken because apparently CSR threatened to close the mine if additional restrictions were to be placed upon their mining and milling of blue asbestos at Wittenoom. It would appear that despite the many warnings from doctors and mining inspectors, CSR continued to run the mine and milling operations with little regard for dust suppression, which is now considered to be the reason for many premature deaths of former Wittenoom workers many years later. During the 1970s Dr Janet Elder, Senior Chest Physician at the University of Department of Medicine at Sir Charles Gairdner Hospital, was horrified by the speed with which the new cases of mesothelioma and other asbestos-caused diseases were developing amongst the former Wittenoom workers. “The dreadful tragedy," she recalls, “was that so many of its victims were very young and very fit when they went there [Wittenoom]." CSR blue asbestos mining and milling at Wittenoom has had a significant impact on all Australians. Western Australia in particular has the highest rate of malignant mesothelioma than any State in Australia or elsewhere in the world per capita of population. The Hon. Sir Charles Court was absolutely right and more than 2000 Wittenoom asbestos diseases deaths are the corroborating factor.